Enjoying morning tea with little Batmunkh Munkbayar, left, to his right Ganzorig Bat, with Purev Lkhajav in hat and Oyun Batbold in purple. The nomadic way of life shapes Mongolia like no other country. Mongolia is the most sparsely populated country in the world – its 600,000-square-mile plateau is home to all who roam the vast steppes. Three-fourths of the county is pasture land with the rest divided between forests and the Gobi Desert. The economy depends largely on animal husbandry. Herders call sheep, goats, cattle, horses, and camels their “five gems.” Technology is embraced, satellite communications and portable power are widespread. Shepherds today are as likely to ride trail bikes as stout ponies but the heritage of tea is timeless. A stimulating hot beverage is critical in the harsh climate where the altitude averages 5,180 feet above sea level and temperatures swing from -40°C to +40°C in summer. Breakfast in Mongolia is drunk, not eaten. Tea (tsai) is generously blended with Mongolian milk (tsu) and butter of various kinds to survive extreme cold weather. Mongolians rarely drink pure water, preferring instead drinks produced with a mixture of milk from cattle, camels, horses, yaks, goats, and sheep. 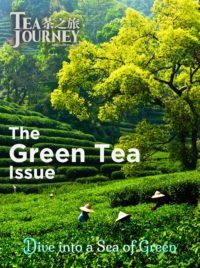 Tea does not grow in Mongolia which has traded with China for centuries and more recently with Russia. 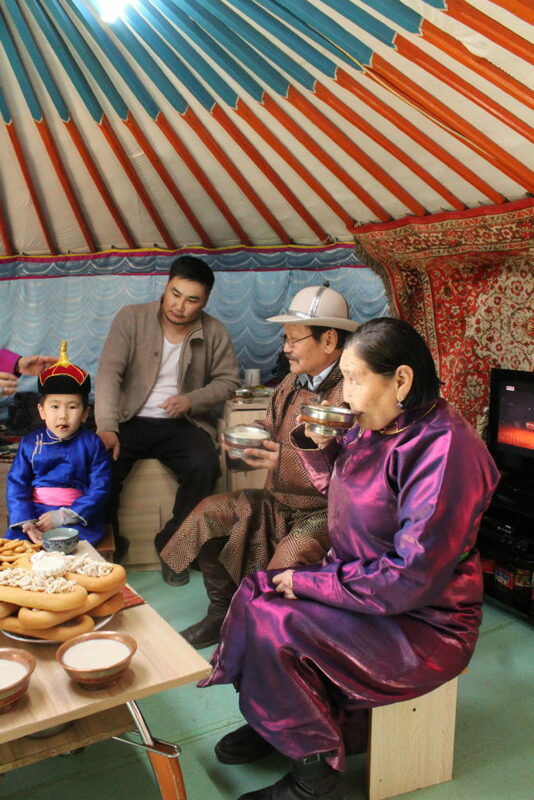 Nomadic herders of the Western mountainous regions prepare a thick, salty tea that can substitute as a light meal while herders along the Eastern steppe drink a thin and non-salty tea brewed from loose leaves. The day begins with the brewing of milk tea (suutei tsai) before sunrise in the large circular tent known as the ger (yurt). A caldron is placed on the fire always facing north, the location of every home’s Buddhist shrine. Yellow butter is put into the caldron and, as it melts, tea leaves pried from a compressed brick are added. 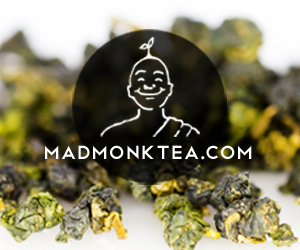 Some recipes call for green tea, others use black tea leaves. The mixture is then fried. Next, water is added and a heavy lid placed on the caldron. The mixture is boiled and well stewed, stirred frequently by a ladle with a large scoop. Subsequently, small portions of salts are put in to make it tasty and then a quart or more of cow’s milk is added to re-boil. The lid is then closed for a while. As the boiling milk tea starts to spill out it is ladled well again. The tea and milk soon dissolve into a thick, buttery drink. The technique calls for raising the ladle of boiling milk high before pouring it back into the caldron at least 10 times. Elders say that the more you ladle, the more delicious the tea. Once completed, the milk tea is skimmed or poured through a strainer to separate the used leaves. The brew is transferred to a large kettle and served all day. Tea remaining in the caldron is sometimes made into a soup called banshtai tsai. The more tea is poured, the better it tastes. Brick tea from Georgia is consumed nationwide, a change in suppliers from antiquity forced by the Soviet Union following the Soviet-Japanese War of 1945. Mongolia was wrested from China’s control by the Soviets who successfully defended the country against Japanese occupation. A peaceful revolution in 1990 led to the adoption of a new constitution in 1992 and the first permanent parliament was formed. The “People’s Republic” was dropped from the country’s name after the collapse of the Soviet Union. Presidential elections followed in 1993. The country is now governed under a multi-party system and market economy. Pouring tea is a ritual. 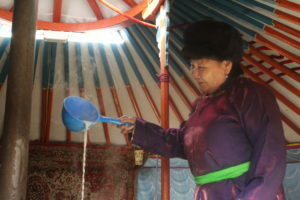 Every Mongolian wife takes the first cup of tea from the caldron and goes outside to spray the tea upward, directing it as tribute to the sky. Mongolia is known as the “Land of the Eternal Blue Sky” (Mönkh khökh tengeriin oron) because it enjoys more than 250 days of sun every year. A spray of tea is then offered to the mountains and the steppe. Spraying tea is a sign of worship and respect for mother earth. Natural environments such as mountains and rivers are widely respected in the country. 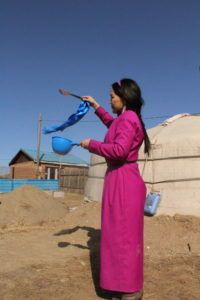 When Mongolians perform this tradition, a wooden spoon tied with a “khadag” is used. The khadag (khata) is a long ceremonial scarf, usually of silk, used to show their highest appreciation. A blue khadag stands for the sky, white represents milk (and a pure heart and soul). Women must cover their heads, usually wearing a hat for the early-morning ceremony. Returning to the home, a wife then places a small cup of tea in front of the framed image of Buddha. She offers the tea to her husband and thereafter to everyone in sequence from old to young. Tibetan Buddhism dates to the 16th century and is the dominant religion in the country. Most families have a framed picture of Buddha or the Dalai Lama in their homes. In the early 1900s, there were 750 monasteries in Mongolia. A third of the adult males at the time were monks but a purge by the Communist regime left only 110. The country is famous for its hospitality, especially in the rural areas. In Mongolia, any incomer will be offered tea without asking whether she or he likes the drink or not. It is proof of expression of the generous attitude of locals. When offered a cup of tea, it is given by the right hand with the left hand placed under the elbow of the right arm. To avoid offense, recipients must drink the tea before placing it on a table. If a visitor is not offered tea, villagers will say that the household has “no tea, no face.” When serving tea, the spout of the kettle (or the mouth of thermos) must not be directed to the door. Those seated for tea are served in a clockwise direction. Milk tea is often served with boortsog (biscuits fried in bouillon fat that remains from cooking meat) or dumplings. Milk tea is the traditional greeting for visitors. Milk tea is widely used during the lunar year fiesta. Each guest receives a cup of tea before every meal. When someone goes for a long trip, his or her family members spray tea or milk on the traveler’s road the minute the trip begins. This is a courtesy that means they wish good things and safety for the traveler. Whenever a herding family sees a nomadic caravan, they bring the caravan tea and dairy. This is evidence of hospitality and good manners and enables the travelers to relax for a while. As the milk tea shows white in color, it is considered a symbol of good deeds. In Mongolia, it is prohibited to waste milk and milk tea. If milk is accidentally poured on the floor, people show regret and touch the milk on the floor with their finger and then touch that finger to their forehead. In modern times urbanized locals still show respect for milk tea and if a family member, relative or close friend gets sick and hospitalized, they visit the patient bringing milk tea and a meal. Mongolians drink tea frequently. So it is common that households brew tea several times a day and keep it in a large thermos containing two to three liters. There are two types of tea namely milk tea and brown tea (non-milk). Mongolians prepare tea in 40 different ways corresponding to the traditions of various ethnic groups and their preference for herd animals. Whether yak, camel or even horse’s milk is used, recipes are high-calorie to prevent herders from freezing during winter or getting hungry. The most popular tea is made with cow’s milk but there are at least 15 different variations of cow’s milk tea depending on the components and brewing techniques. “Khiitstei” tea – This variation calls for flour to be added while the butter melts in the caldron. The tea is fried and boiled as described above. Some families prepare brown tea separately first and add it to the caldron while butter and flour are being fried. Then milk is added. Tea with yellow rice – In this recipe, yellow rice is added as butter melts, and the mixture is then fried. Tea with white rice – Rice is also used. Some add flour to the rice to make the tea thicker. Tea with dumplings – First dumplings are prepared. The tea is then brewed without milk. Flour is added as when making “khiitstei” tea and the mixture boiled. Subsequently, salt and milk are added. After boiling and stirring, dumplings are added and the mixture is re-boiled. This tea can be medicine for tiredness. Tea with “borts” (dried meat) – The recipe begins as “khiitstei” but two spoons of dried meat are ground and added before frying. Tea without milk is then poured and the mix boiled. Yellow or white rice may be added. Once the rice is ready, milk is supplemented and the mix re-boiled. Tea with bone – Marrowbone, whirlbone and even the head bone of sheep are used. This method is considered medicinal and a key to removing stress. The bones are added usually separately while the milk tea is boiling. In addition, various ingredients such as barley, saline, nettle, and dill are applied to make milk tea tasty. Click here to see a number of authentic Mongol recipes. Urban households brew milk tea in a kettle on the stove instead of a caldron over an open fire. Every local restaurant and canteen serves milk tea as its primary drink option. The average price of a cup of milk tea is MNT500 to MNT1000, equivalent to 20 to 40 cents a cup. One high-end traditional restaurant called “Modern Nomads” sells milk tea at double that price but this chain restaurant is famous for its delicious milk tea. Today several firms process and package milk tea, including tea in packets. Last January the Monos group introduced “Ueg” milk tea in local markets. 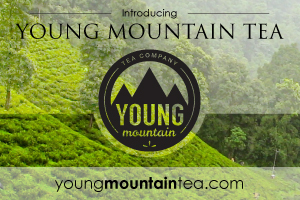 This is a more convenient tea sold to support their goal of good health. The brand features “suli flour” which is extracted from a natural plant that only grows in Mongolia. The milk tea is enriched with saline and “jamts” salt which is said to aid digestion and benefit the immunization system. A year ago, the IKH TAIGA company began producing a packaged milk tea called “Nuudelchin.” Ingredients include barley, yellow butter, saline, milk, and other plants. This processed tea can be consumed by simply adding hot water in a cup. 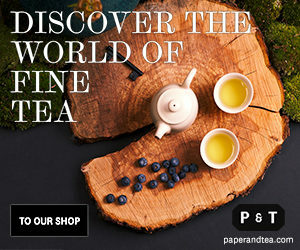 The company’s CEO, Mrs. Suvd Shagdar, said the tea will help to continue the ceremony and traditions of Mongolian tea for the next generation. She is seeking recognition by the United Nation’s Educational, Scientific and Cultural Organization (UNESCO) to register the tea as a physical example of Mongolia’s cultural heritage. Nice piece. I clicked through to the recipes inspired to bring authentic Mongolian food into our kitchen tonight —> just off to fetch my half medium sheep!